On-demand computing, using the Internet to provide shared computing resources and storage. Cloud-based computing (“the Cloud”) is one of the leading technology topics in the world. Cloud computing, sometimes called on-demand computing, uses the Internet to provide shared computing resources and storage of records or documents. The term covers everything from emailing or photo sharing on a commercial service like Google to hosting the entire computing infrastructure of a global corporation from remote data centers. For more insight, a formal US government definition of cloud computing is provided from the National Institute of Standards (NIST). Cloud ERP, often called Cloud-based ERP, enables a company’s accounting, operations management and reporting to run in the cloud. As one would expect, Cloud ERP Software vendors vary significantly in their technology, functionality, and service. After researching Cloud ERP Software vendors, it becomes clear that they have few things in common beyond hosting of an application and utilizing the internet to provide connectivity. Key Cloud Solutions is one of the few vendors that offer a true Cloud ERP Software solution. The Cloud is particularly valuable to small and medium-size businesses (SMB’s) because it provides access to full-function applications at a reasonable price without substantial operating expenditure for hardware and software. Using the correct cloud provider, a company can rapidly scale as their business grows or a new company is added. At its most basic, cloud computing is all about renting processing resources and storage rather than buying and maintaining them in-house (on-premise). It may come as a surprise to some, but this is not a new concept. In the 1970’s, service firms used large mainframes to run applications and provide data storage for other companies that would rent those computer resources and storage space. This was called “time-sharing”. Time-sharing was expensive and fell out of favor once the price of computers dropped and companies could afford to buy and maintain their own systems. For the last few decades, companies have been buying, installing and maintaining their hardware and software in their own facilities. Fortunately, new technologies have been introduced such as widespread Internet availability, low cost of mobile devices, expansion of computing power and massive storage availability. Technology has improved so much that very high functioning applications can safely and securely run remotely on somebody else’s hardware. This eliminates the need for individual companies to deal with hardware issues and allows their employees to work anywhere at any time. IDC, a premier global provider of market intelligence, recent wrote about the “IT Industry’s 3rd Platform for Innovation and Growth”. In their eBook, “True Cloud Applications for Agile and Fast-Growing Businesses”, IDC discusses the “explosion of innovation” that we are witnessing. Download the eBook to see what is in store for IT. Perpetual or Purchase: These terms refer to when a company BUYS a software license. The company pays to owns the license and also pays an annual maintenance fee for upgrades. Subscription: The company pays an annual or monthly charge to use the software license. Upgrades to the software is usually included in the subscription price. Hosted: The company or hoster buys a license for the software. The hoster manages all, or most, of the infrastructure and software deployment as described above. The hoster can be an independent company or a division of the company itself. Hosting is a way to outsource IT operations. Software as a Service (SaaS): This newest method of deployment is a combined software licensing and delivery model in which software is licensed on a subscription basis and hosted by the software provider, all for a single price that is typically a fixed amount. In many cases the software provider uses a Public Cloud for the hosting. Private cloud is privately owned and maintained by the company or a hoster. Based on business requirements or regulations, sometimes this may be the only option. Public cloud is owned by a service company, such as Microsoft, IBM or Amazon. The service provides all the hardware, load balancing, backup and security. Hybrid cloud is a blended approach with a mix of on-premises, private cloud and third-party, public cloud services. Multi-tenancy is where the Cloud software provider has single instance (version) of software on a server and serves multiple tenants (customers) simultaneously. Single-tenancy is where each customer has their own application and data base. It is believed that multi-tenancy reduces the cost for the software provider, which is absolutely true for cloud apps that are quickly purchased and downloaded like Pandora, Facebook, etc. For Cloud ERP, the cost savings is insignificant compared to: providing the server hardware, operating system and database; development of the very sophisticated ERP programs; sales and marketing required; as well as on-going support. Note: Acumatica can run either multi-tenancy or single-tenancy depending on the customers’ needs. Thin client in cloud terms is a device (PC, tablet or phone) that requires NO application or communication software to be downloaded. Any thin client can access the application from anywhere, similar to a web page. Web services are simply application components. They are designed for and used on the Web. Common examples are the widgets on a phone, such a weather. Business applications may include zip code look up, sales tax calculation or much more sophisticated applications. To help in clarifying all the confusion the SMB group has created an eBook called “Clearing the ERP Clouds”. Use this eBook to help guide you. Beware of “cloud washing” and “faux cloud” adaptations of last generation applications that purport to be re-engineered for cloud deployment. Most legacy applications have just been retrofitted to run on the web. You can identify a “faux cloud” product because they will require software to be installed on the client (PC or device). Others add another special server between the applications and the user to interpret the application and serve up web pages to the client. Neither approach delivers the speed and responsiveness of a true cloud design. True cloud applications have no application code on the client device except a browser. They are designed and built for the web and mobile devices. True Cloud screens must be responsive and change size based on the device, which is a productivity aid for a mobile employee or customer. When vendors place legacy software on a hosted virtual server, they claim to have a “cloud-based ERP solution”; but without web-based software, customers receive very few of the benefits described in the first section above. The presence of a thick client (a full-featured computer that requires software installed on the device) often requires longer installation times, dispersed data, client upgrades, and complicated remote access software. When looking for cloud ERP software, make sure that it is web-based and true cloud! To help clarify the confusion, the SMB group has created an eBook called “Clearing the ERP Clouds”. 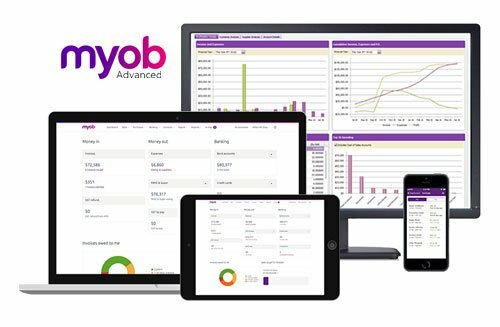 MYOB Advanced Cloud ERP is a flexible and cost-effective option for small and medium-sized businesses. Device mobility to easily switch between desired mobile device such as an Apple iPad, iPhone and Google Android or use a Windows, Mac or Linux desktop computer. All the flexibility above, plus the safety and security of a hosting provider such as Amazon Web Services and Microsoft Azure public clouds. MYOB Advanced is available securely in the Cloud delivered on the leading Amazon AWS platform. This release includes enhancements that further the goal of providing a solution that boosts your productivity, delivers easy-to-use insights into your business, is easy to implement, and connects to other cloud applications to provide an overall increase in productivity.